On Sunday 15th January 2012 Enter CIC were visited by Major Chris Lawton MBE and Ex-Serjeant Paul Cocoran from The Rifles ‘Care for Casualties’ Charity. Since July 2011 Enter CIC have been helping The Rifles raise funds through our song ‘Tell Me What It’s Like’ that is available to buy from itunes and amazon.co.uk. The track costs 79p and all of this goes to the charity. The band Teenage Chorus, who wrote the track presented the charity with a cheque for £153.56 from the sale of the song so far. 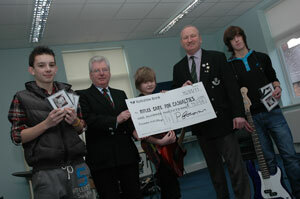 In July 2011 we presented The Rifles with a cheque for £400 after some fundraising at our Help for Heroes performance.